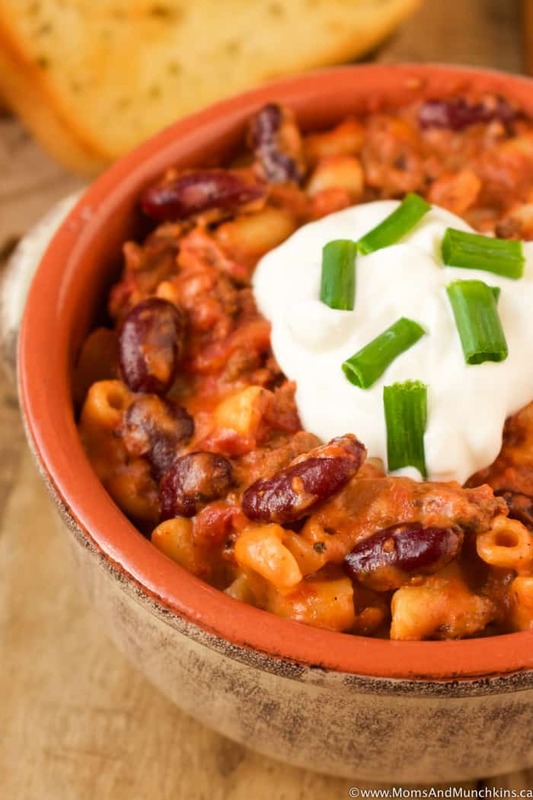 What types of comfort food do you crave during the cold weather seasons? Stews? Soups? Casseroles? Or do you still turn to ice cream for comfort even in the middle of winter? 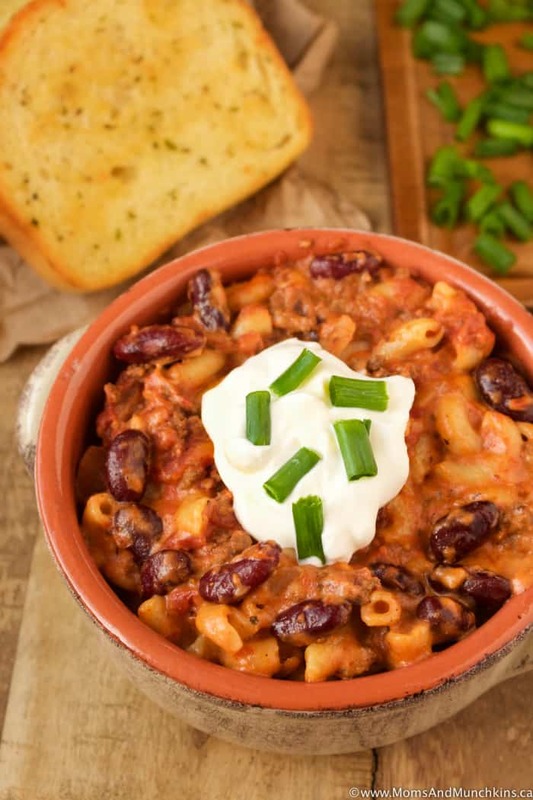 I’m more of a sweets person (I know, no surprise there with all the dessert recipes I create) but I thought I’d mix things up a bit here and share a slow cooker recipe that’s great for a family meal – Chili Mac and Cheese. This isn’t one of those recipes where you put everything in the slow cooker and you’re done. There are a few more steps in the recipe but I promise you it’s worth the little extra effort. I’d say this recipe is medium spicy – not too hot but not too mild. If you’d like to make it spicier, add an additional teaspoon of crushed red pepper flakes. Optional: serve with a scoop of sour cream and green onions on top with a side of garlic toast. If you'd like to make it spicier, add an additional teaspoon of crushed red pepper flakes. Optional: serve with a scoop of sour cream and green onions on top with a side of garlic toast. In a large frying pan, brown & thoroughly cook the beef. Drain fat and place cooked beef in the slow cooker. Add the kidney beans, diced tomatoes, crushed tomatoes, onion, chili powder, pepper, salt, cumin, garlic, oregano, onion powder and crushed red pepper flakes to the slow cooker. Stir well to combine all ingredients. Place the lid on the slow cooker and set temperature to high to cook this for 3-4 hours. If you're setting this to low, you'll want to cook it for 6-8 hours. In a large pot, cook macaroni al-dente (macaroni still slightly firm). Drain cooked macaroni then add macaroni to slow cooker. Stir well to mix then cover again with the lid. Start preparing the cheese sauce when you have about 30 minutes left of cooking time on the slow cooker. In a medium saucepan, melt butter over medium-high heat. Reduce heat to low-medium and whisk in flour. Whisk in heavy cream and continue to whisk for 5 minutes while mixture is simmering. Stir in shredded cheese until mixture is smooth and completely melted. Pour cheese sauce into slow cooker and stir well to mix. 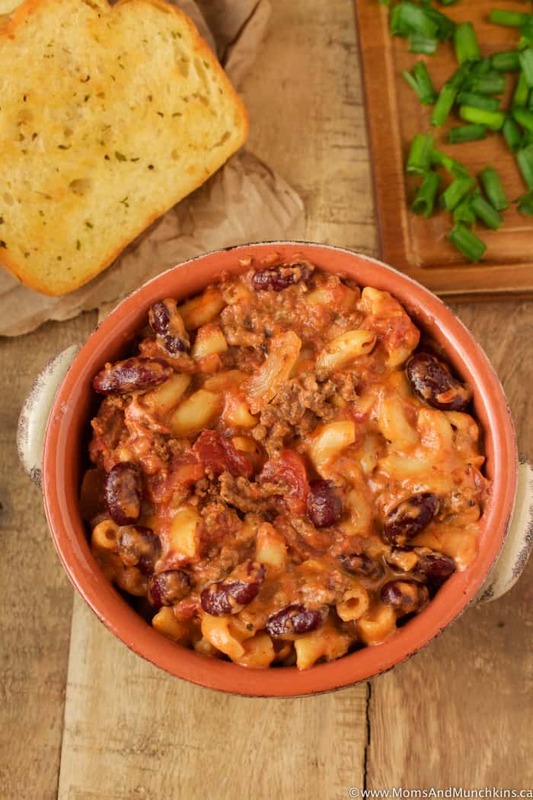 Let chili mac and cheese mixture simmer, on low heat setting, for 20 minutes before serving. 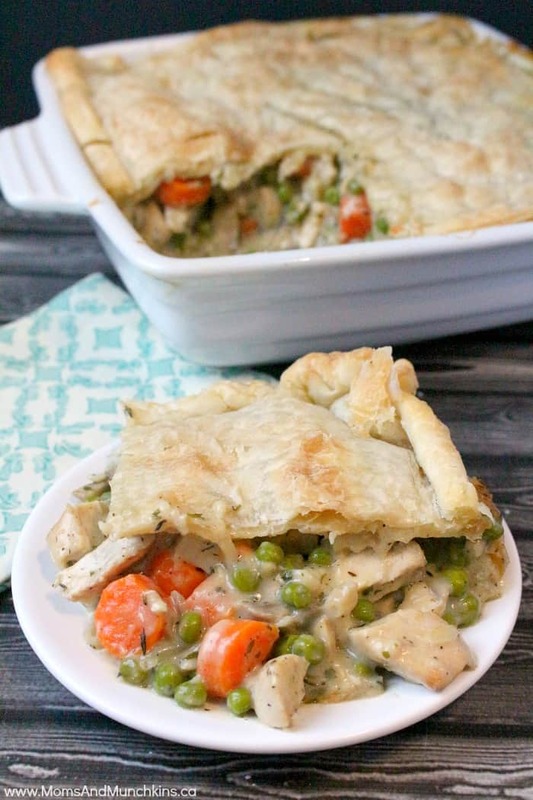 Chicken Pot Pie – this is seriously the best pot pie recipe! 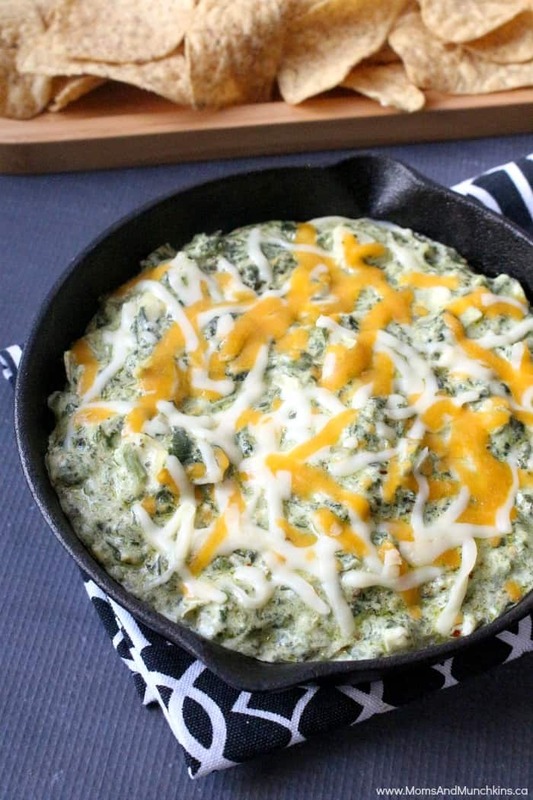 Hot Artichoke & Spinach Dip – perfect party appetizer! Find more tasty ideas on our Recipes page. Stay updated on the latest recipes and home entertaining ideas by following us on Facebook, Instagram, Twitter and Pinterest.